So colorful and scrumptious at the same time! 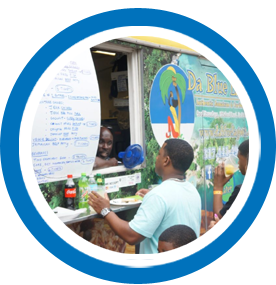 Da Blue Lagoon: Jamaican Kitchen - Authentic Jamaican cuisine sure to make you feel irie man! Click to find out more. There are a lot of restaurants claiming the title authentic, but only one restaurant can be the grand champion of Jamaican Cuisine. See why Da Blue Lagoon is the don dadda of them all. Check out the food that has earned our great reputation! If you haven't had a chance to engage with us yet, here is your chance! "Like" our Facebook page and check out the vibes Da Blue Lagoon gives off. Don't forget to take advantage of our special online deals too. Ready to escape from winter to a tropical paradise? 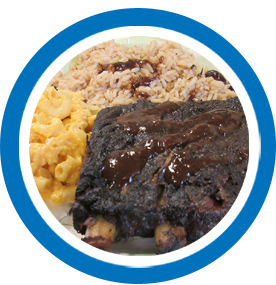 All of our “Reggae Fest” meals are served with Rice & Peas (Beans) or Yellow Rice, and your choice of one of our signature sides. Our signature sides include: Buttered-Steamed Vegetables, Fried Plantains, Festival Rolls. We also offer popular “Coco Bread” Sandwiches and “Island Bites”, both which are served with Island Seasoned Fries. Though we offer a wide selection of exotic items, there are a few popular menu items that never change. Typically, we focus on lunch items during the week and dinner items on Fridays and Saturdays.